Anyone LOOOOVE pasta out there? I am a huge pasta fan. It’s for sure my comfort food. Until this year, I was really hesitant about the whole spirializer trend. I mean, a zucchini is no pasta dish, even if it’s in the shape of spaghetti. But then I ended up getting one and oh man! It’s a game changer. My favorite thing to turn into noodles is by far a sweet potato. It’s the perfect kind of al dente noodle. We have this recipe below at least once a week. It’s so easy and quick! 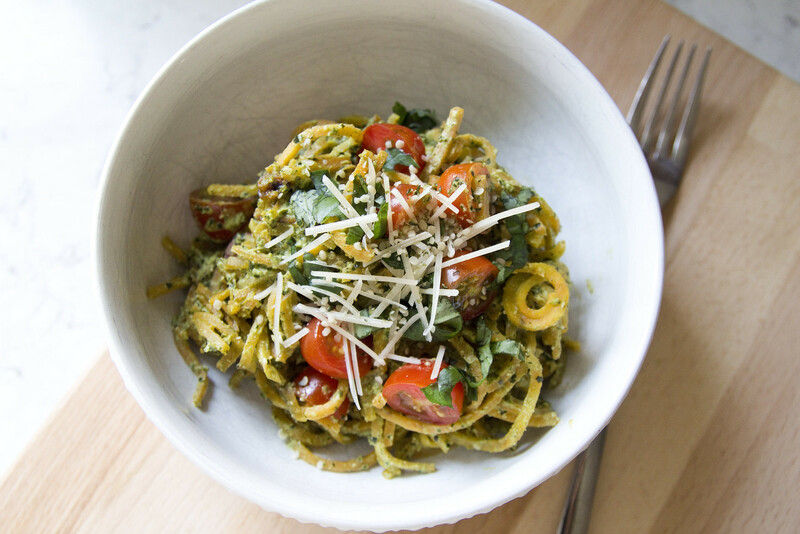 Don’t be intimidated by making the pesto either- so quick & easy. 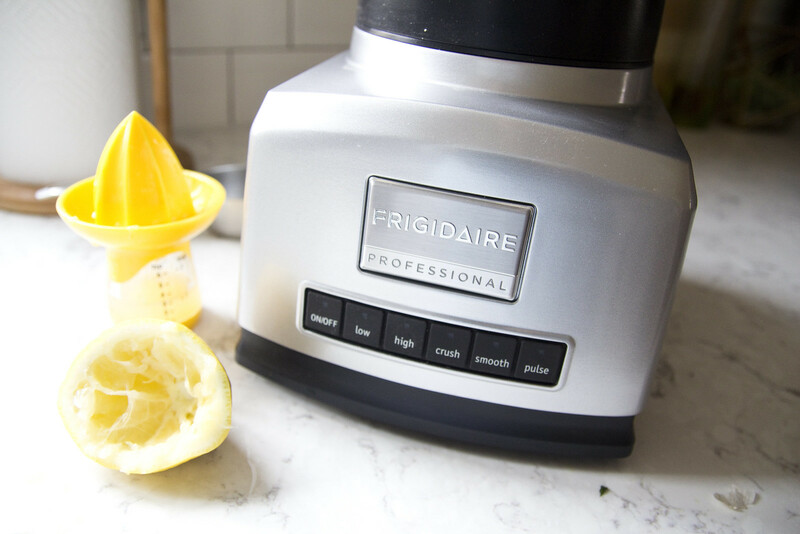 You don’t have to worry about needing a food processor; a blender works great. 1. 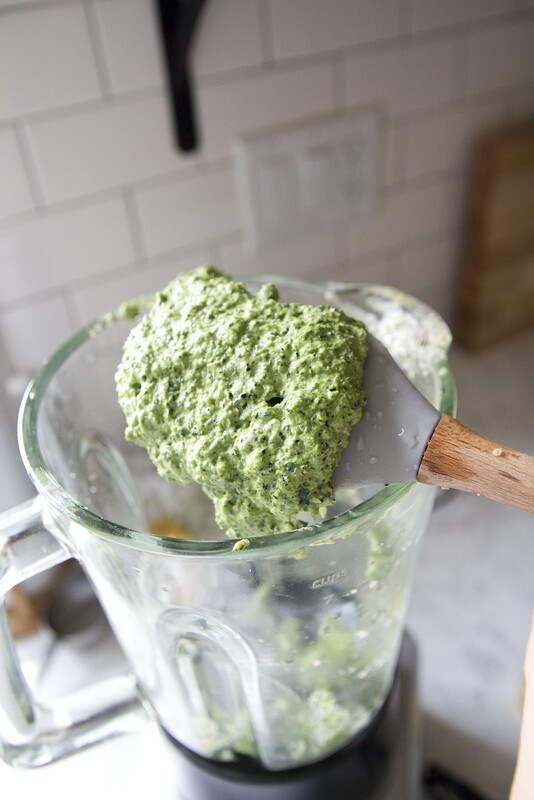 Make the Pesto: In a blender, add the peeled garlic and hemp seeds and pulse together. 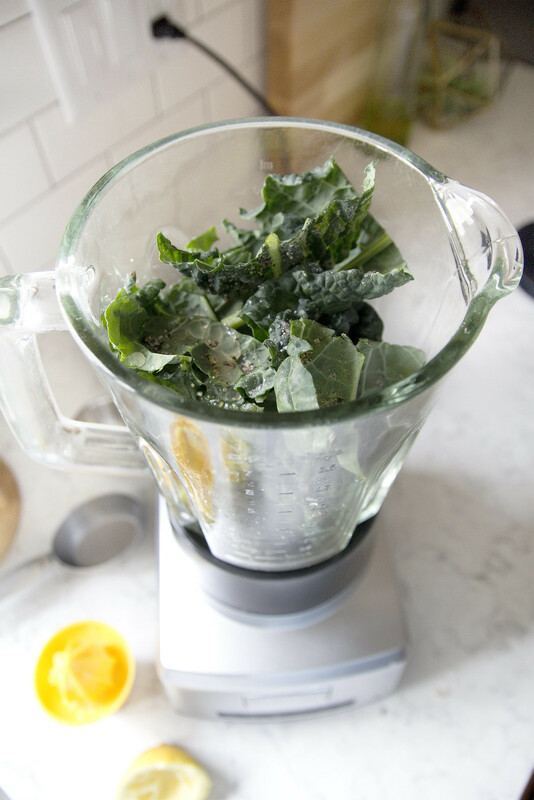 Add kale and pulse again. 2. Add lemon juice, olive oil and generous amount of salt and pepper and pulse again. 4. Transfer to a small pot and heat on cooktop over low heat. 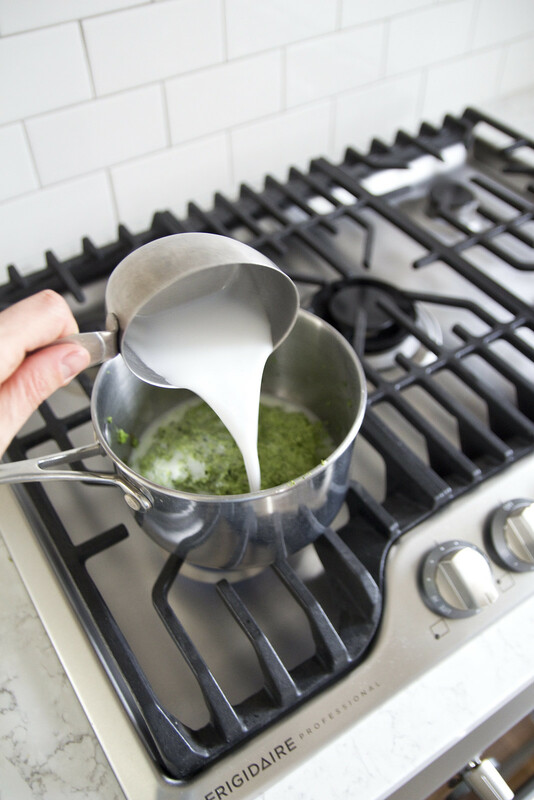 Add non-dairy milk a little at a time and whisk together until it’s your desired consistency. I like to thin out and make a creamier sauce. 5. 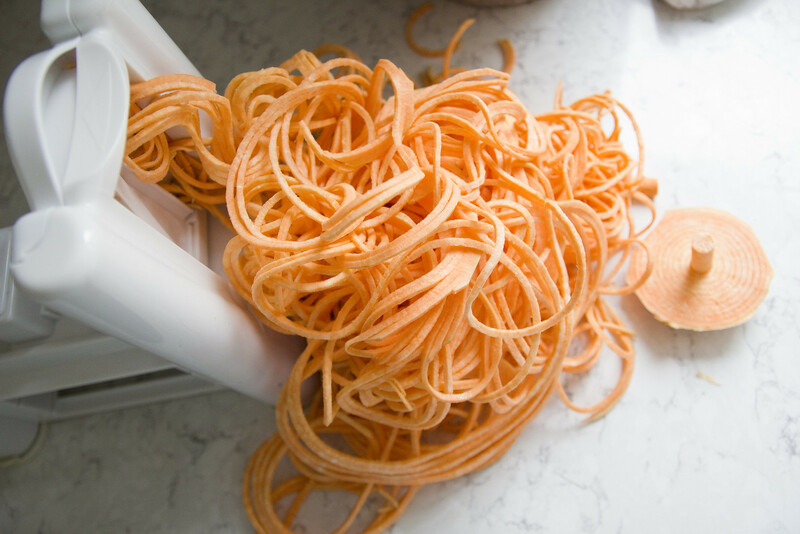 Sweet Potato Noodles: With a spirializer, make noodles with your sweet potatoes. 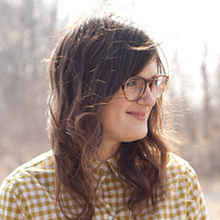 You could use a julienne peeler – it’s tedious, but it can be done. 6. 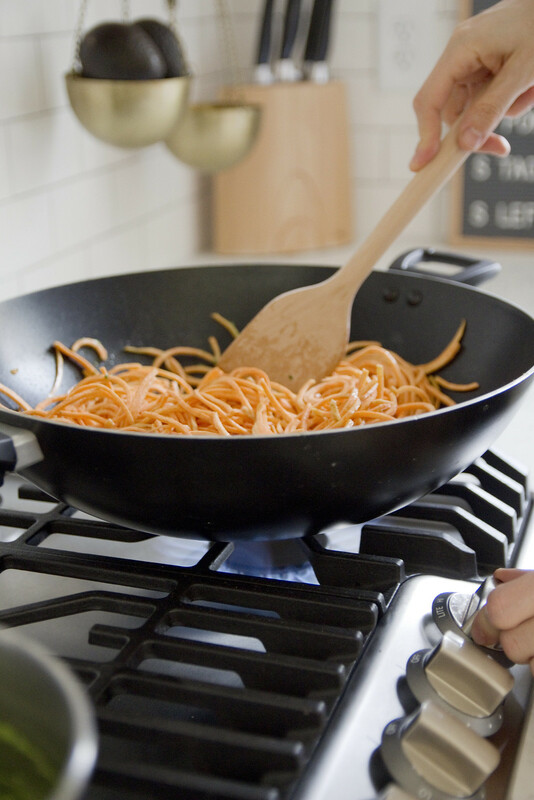 Add noodles to a large skillet or wok. Add 1 tablespoon of olive oil and toss with tongs to coat. Continue to toss with the tongs every minute to prevent the potatoes from burning or becoming stuck on the bottom of the skillet. Do this for 5-10 minutes. The cooking time will depend on your preferred texture of the noodles. If you love a little crunch, cook for 5 minutes. If you like a softer noodle, cook for around 10. 7. 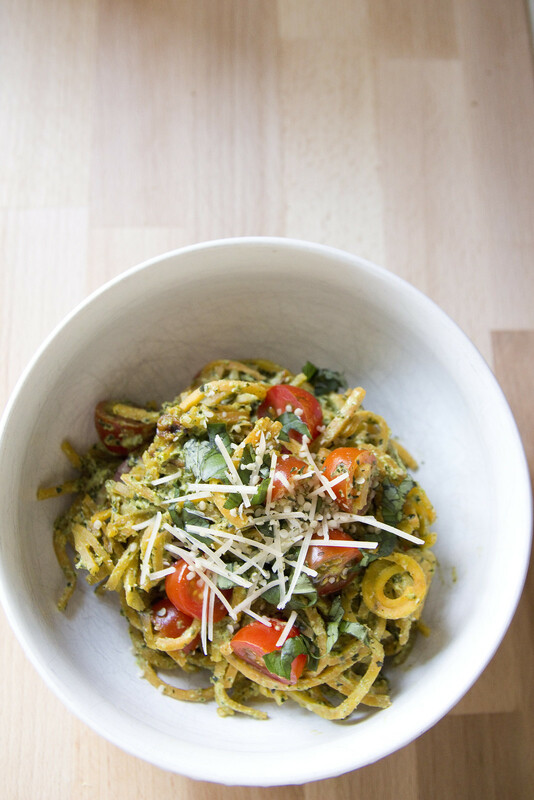 When the noodles are at the desired texture add the pesto sauce and tomatoes. Toss to coat. 8. 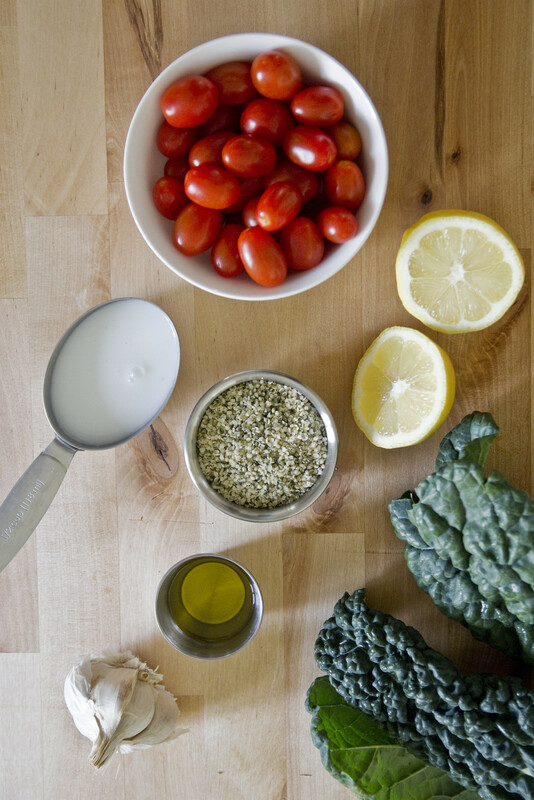 Serve in bowls and top with chopped basil, freshly grated parmesan and sprinkle with a few hemp seeds. Cooking Tip: In a rush for dinner? Add a tiny bit of water to the pan when cooking the noodles. The high heat of the PowerPlus Burner on the Frigidaire Professional Cooktop will help steam the noodles and cook them in a jiffy. We love our new open shelving and pantry! It’s everything we had hoped for! It totally opens up the kitchen and I love the modern look of it all. 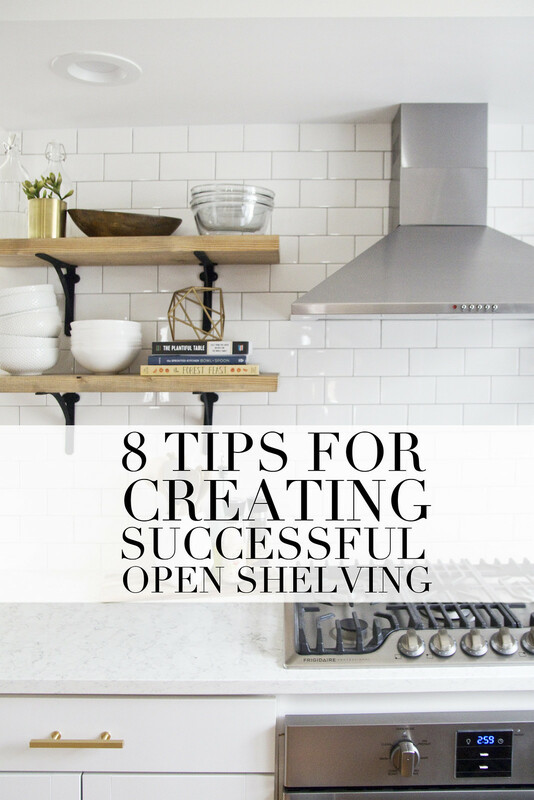 When I posted the picture of the kitchen reveal last week, I got a ton of questions about how to create open shelving, how to make it function well in your kitchen and what we did with the rest of our stuff! 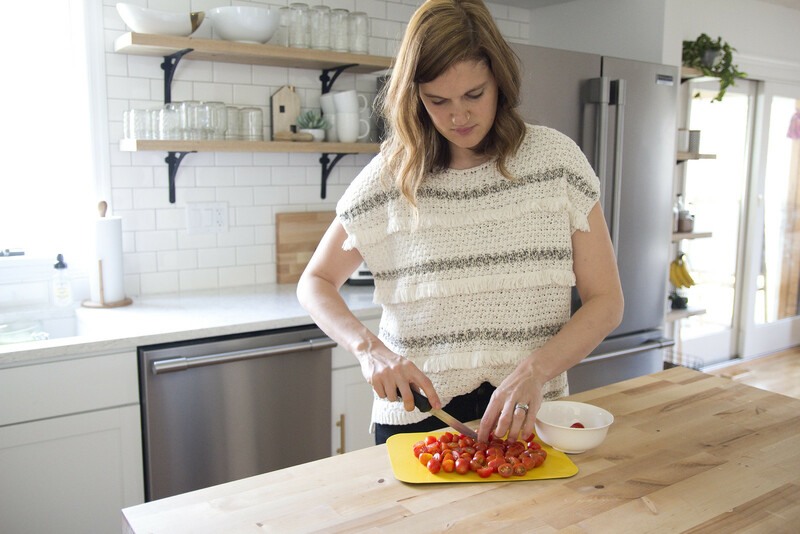 I decided it would be a good idea to go into the nitty gritty of it all so you can feel confident if you are thinking about making the switch in your own kitchen. 1. 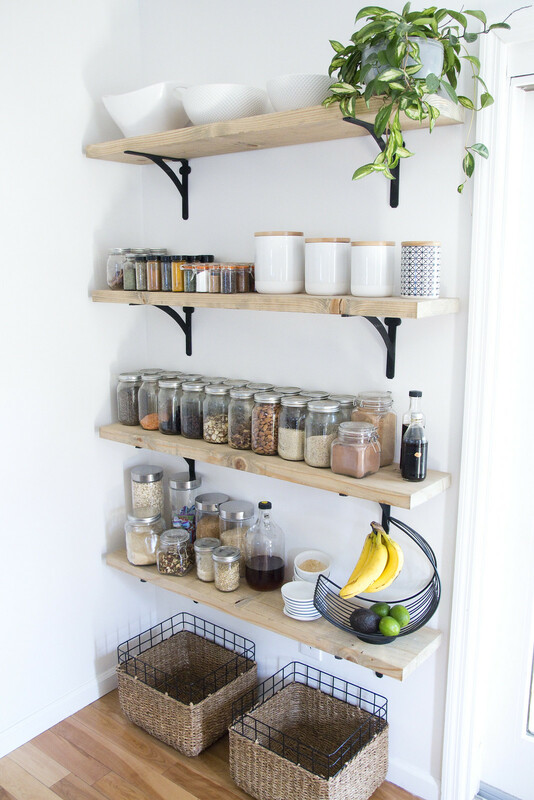 Take all the measurements for how long you will need each shelf. When you don’t have all the tools, Lowe’s is there to help! They cut all our wood for us to the exact measurements we needed. I wanted a thicker shelf so we went with 2” thick wood. 2. 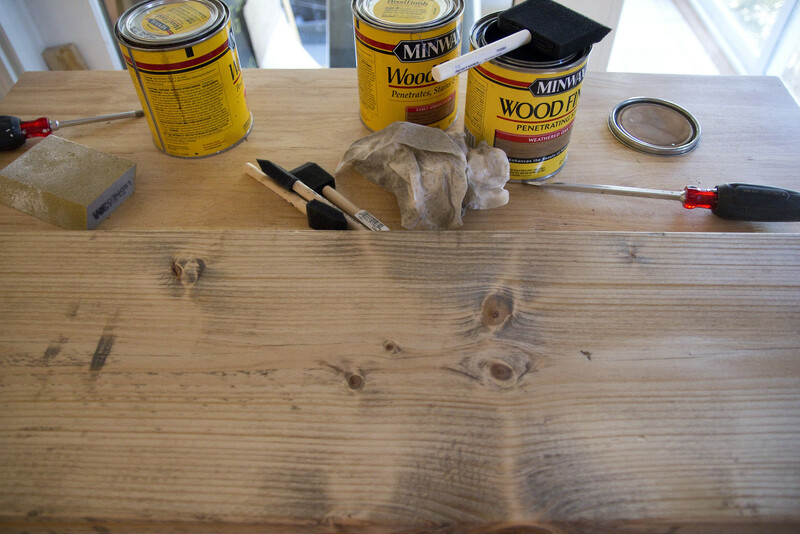 Stain each of the shelves. We used a Weathered Oak stain and I love how it gives it a reclaimed wood type look without the hassle of finding reclaimed wood. It’s the perfect stain color. 3. 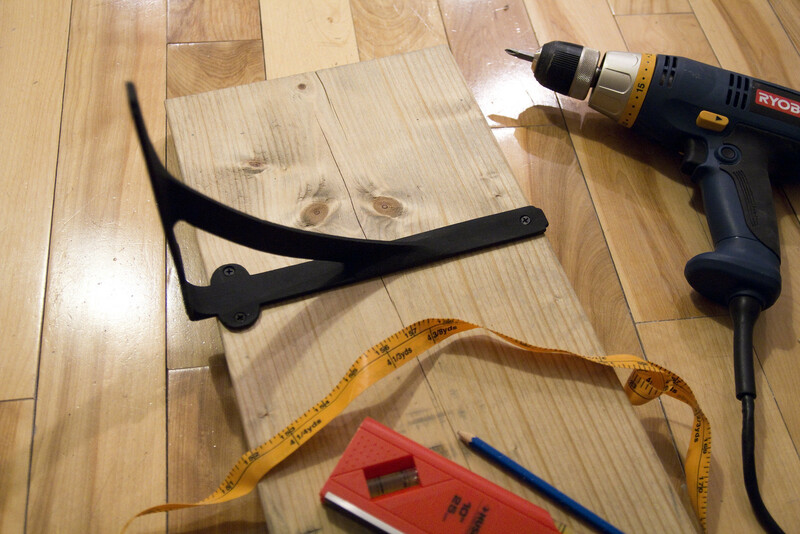 Take measurements on your shelves where you want the brackets to go and screw in each bracket to the shelves. I decided on placing the brackets 7” in from each end of the wood. 4. For the pantry area, we used heavy-duty dry wall anchors. I didn’t like where the studs where in relation to where I wanted to place the brackets, so the anchors let me do whatever I wanted. TIP: Measure twice! Drill once. haha. Learned that lesson a few times. 6. Drilling into tile is intimidating!! We watched soooooooo maaaaaaaany YouTube videos (anyone watch the videos with Shannon?). 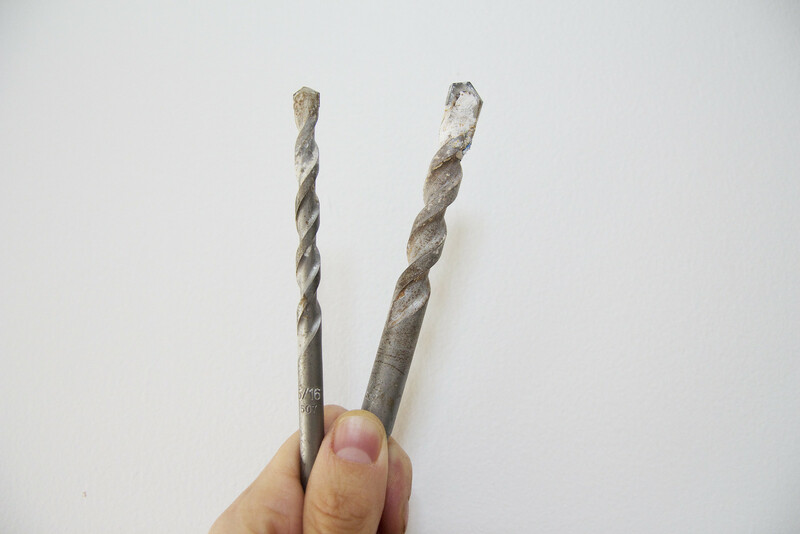 What helped us the most was to get a masonry drill bit, make an “x” with masking tape to give some texture for the drill bit to stick to, and using a sponge, drip water on the drill bit while drilling into the tile. We used these anchors to hang the shelves over the tile. 7. 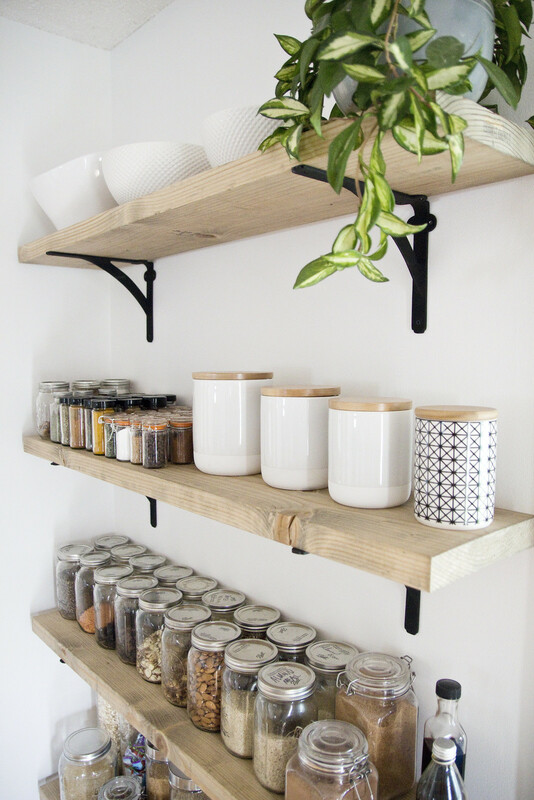 Start organizing, styling and putting your new shelves to good use. 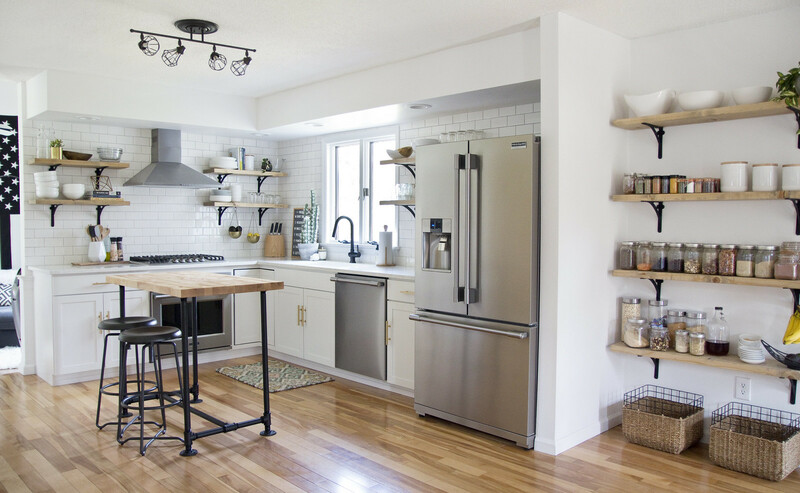 You will love how open it makes your new kitchen! 1. Clean and purge! 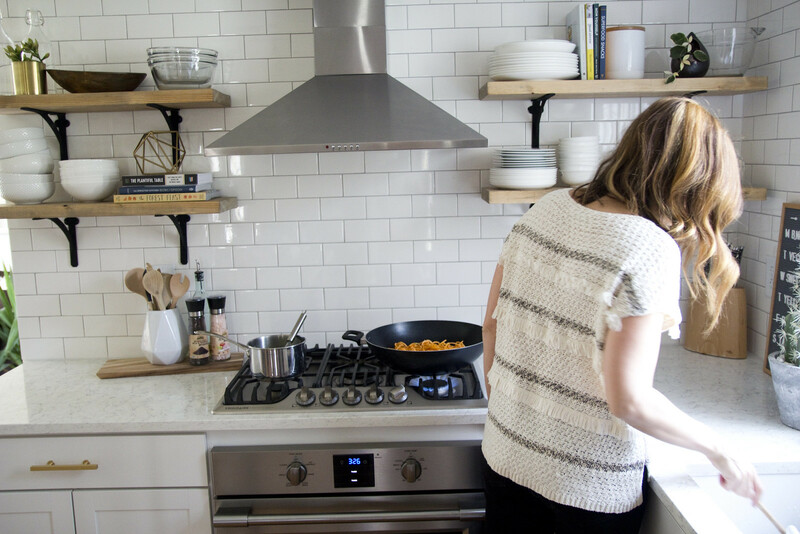 You will be surprised about how much you have when you empty your kitchen all out. I ended up donating about half of what we kept in our kitchen. I only kept the things we use everyday. 2. Find the balance between function and decoration. 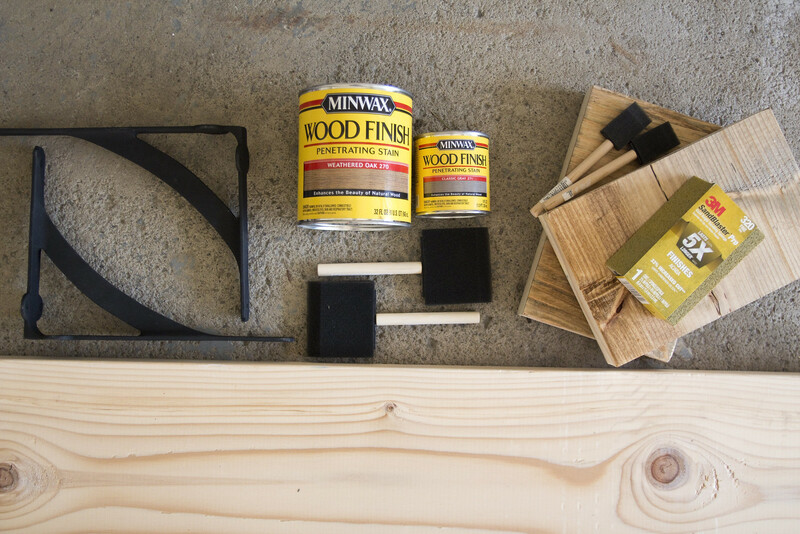 When you take your upper cabinets down, the shelves need to be functional, as well as look good. For us, we kept all our dishes a single color (white) or clear glass so it didn’t look messy or overwhelming. 3. Maximize the storage in bottom cabinets. Look into organizational items, like wire racks, that can really help organize every inch of space. It really makes a huge difference if you aren’t wasting space! 4. A closed-door pantry. We are lucky enough that we actually have a pantry with two doors. We moved the items that we didn’t want on the open shelves in there (i.e. kids plastic cups and plates). We also have our large bulk items from Costco in there. Everything else gets put into the glass jars on the open pantry shelves. 5. Dry goods. I love the bulk section at our local co-op. I get most of our dry goods from there and keep them in large mason jars on the shelves. It makes for a perfect open pantry – they all look so beautiful with their subtle colors and interesting textures. 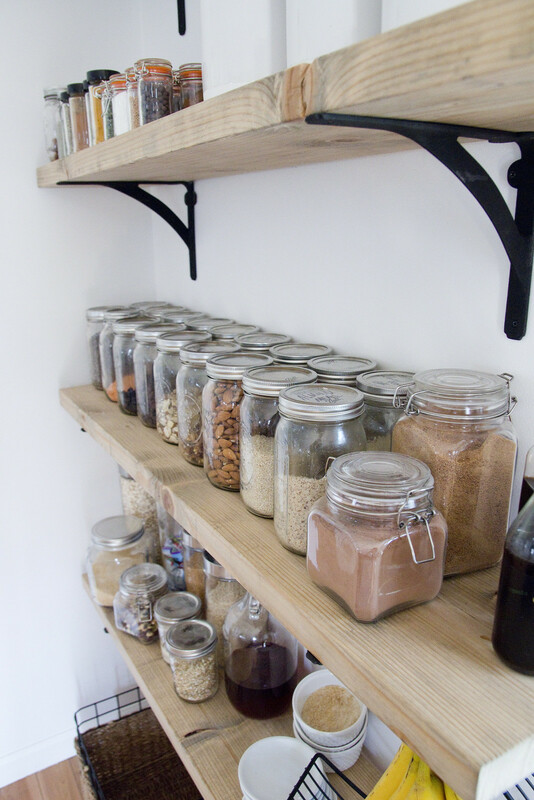 We keep an array of nuts, seeds, flours, sugars, oats, shredded coconut, cranberries, chocolate chips, etc… in our jars. We store our packaged snacks/food in cabinets to help keep an organized and minimal look. 6. 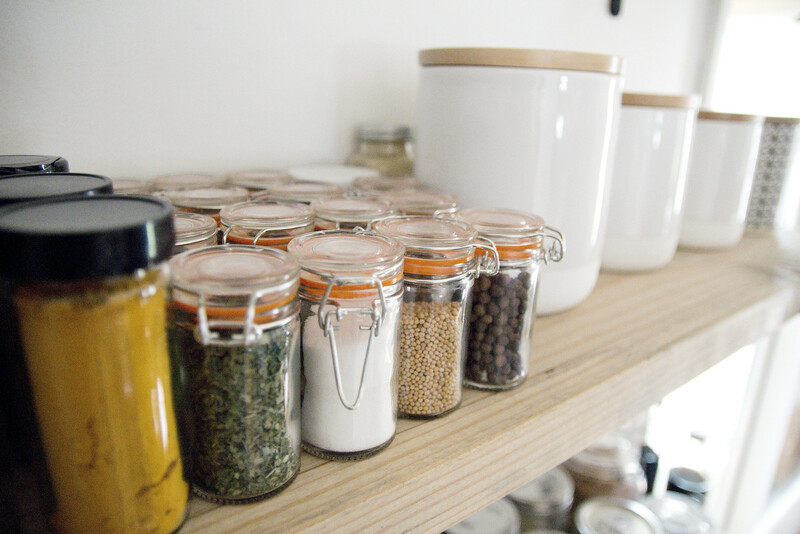 Transfer all your spices to clear glass jars. I love these spice jars from Amazon and how they look on the shelf together. 7. 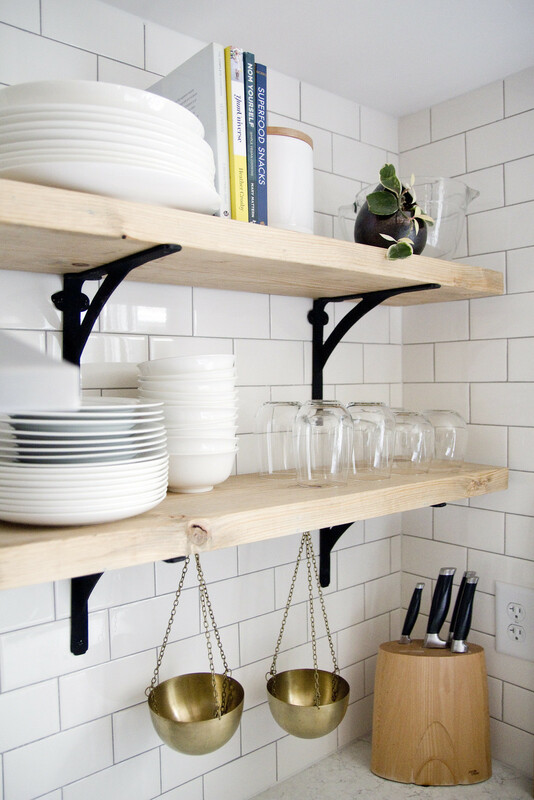 Get creative, use hooks under the shelves to hang mugs, or try hanging bowls/baskets for fruit. 8. Have fun! That’s the best part of having open shelving. You get to rearrange and decorate anytime the mood strikes. Let your creative side go wild! 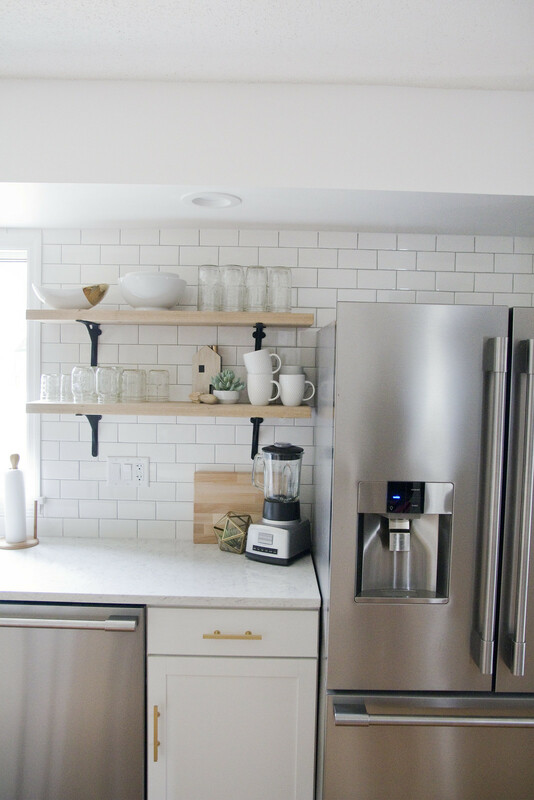 You can see the full kitchen reveal post here!